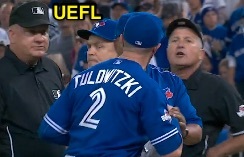 HP Umpire John Hirschbeck ejected Blue Jays SS Troy Tulowitzki for arguing a strike three call in the bottom of the 7th inning of the Royals-Blue Jays game. With none out and none on, Tulowitzki took a 2-2 fastball from Royals pitcher Kris Medlen for a called third strike. Replays indicate the pitch was located over the outer edge of home plate and thigh high (px .833, pz 2.121), as were the ensuing called strikes to batter Russell Martin, the call was correct. At the time of the ejection, the Blue Jays were leading, 10-4. The Blue Jays ultimately won the contest, 11-8. This is John Hirschbeck (17)'s seventh ejection of 2015. John Hirschbeck now has 13 points in the UEFL Standings (8 Previous + 3 MLB-PS + 2 Correct = 13). John Hirschbeck now has 17 points in Crew Division (16 Previous + 1 Correct Call = 17). This is the fourth ejection of the 2015 MLB Postseason and 214th overall ejection of 2015. This is the 100th player ejection of 2015. Prior to ejection, Tulowitzki was 2-4 in the contest (2 SO). This is the Blue Jays' 14th ejection of 2015, 1st in the AL East (TOR 14; BOS 10; NYY 9; BAL, TB 5). This is Troy Tulowitzki's first ejection since June 6, 2014 (Dan Iassogna; QOC = Y [Balls/Strikes]). This is John Hirschbeck's first ejection since September 20, 2015 (Joe Girardi; QOC = U [DiMuro]).